Published by Frederick Warne & Co., Ltd. London 1960. London 1960. Hard back cream paper covered boards with oblong pictorial onlay to front panel, dark green lettering, colour illustrated end papers. 4.25" x 5.6". Date Code 874.960. Fine condition book, in very near Fine condition dust wrapper, not price clipped 3/6. Dust wrapper supplied in archive acetate film protection. Member of the P.B.F.A. Published by Frederick Warne & Co., Ltd. London circa 1970 edition not stated. 1970. Hard back orange paper covered boards with onlay to front panel and in Very Good condition. Dust wrapper with light finger marks to edges. Member of the P.B.F.A. Hard back grey paper covered boards with onlay to front panel. Small rubs to spine tips, no dust wrapper. Member of the P.B.F.A. Published by Frederick Warne & Co. London circa 1955 edition not stated. 1955. 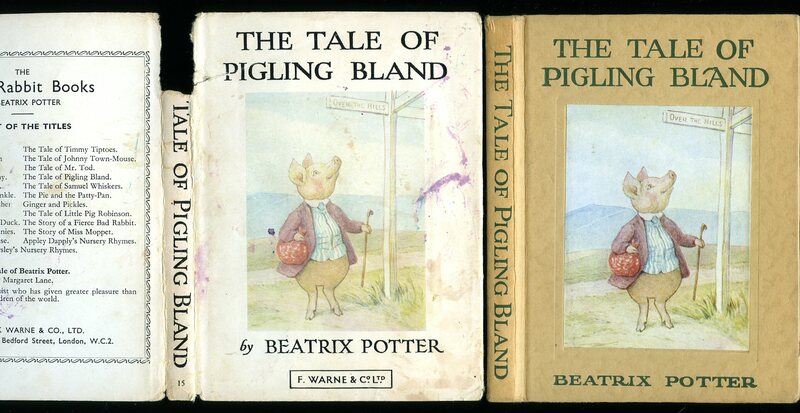 Hard back binding in publisher's original pale green paper covers, onlay to upper panel. Reading condition with spine covering missing and pages loose. Member of the P.B.F.A. Published by Frederick Warne & Co., Ltd. London 1963 edition. London 1963. 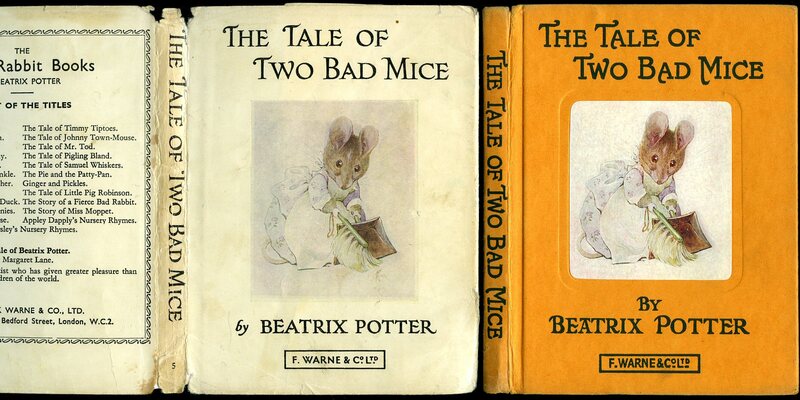 Publisher's original deep scarlet paper covers, colour onlay to the upper panel, black lettering to the spine and the upper panel. 5½'' x 4¼'' 75 printed pages of text. Date code inside last page 972.963. 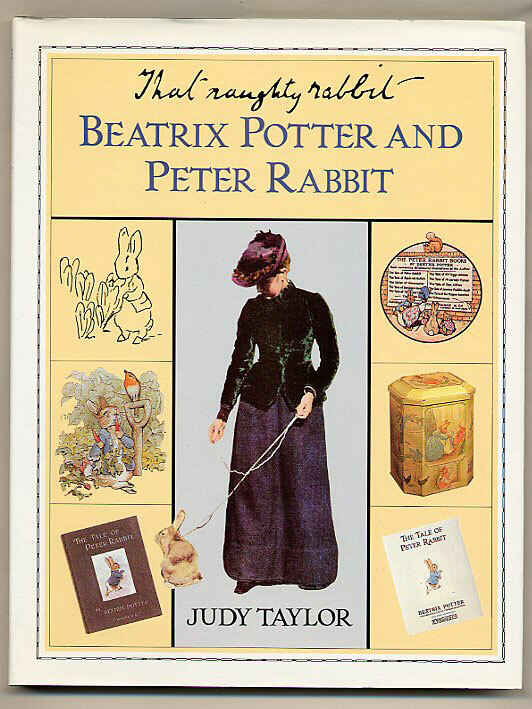 Colour illustrated end papers, full-page colour illustrations. Without any ownership markings and in Very Good clean condition, no dust wrapper. 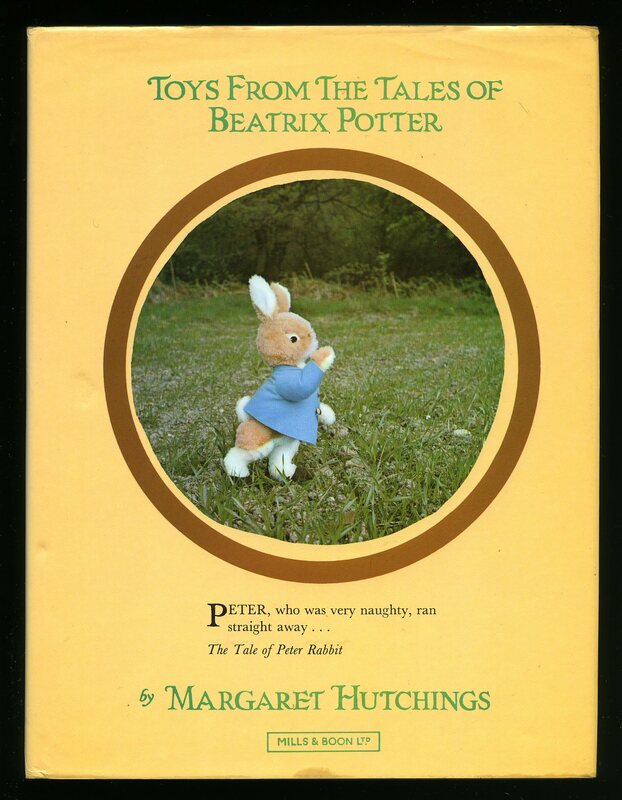 We currently hold in stock 35 other titles by Beatrix Potter. Member of the P.B.F.A. Published by Frederick Warne & Co., Ltd. London circa 1950 edition not stated. 1950. 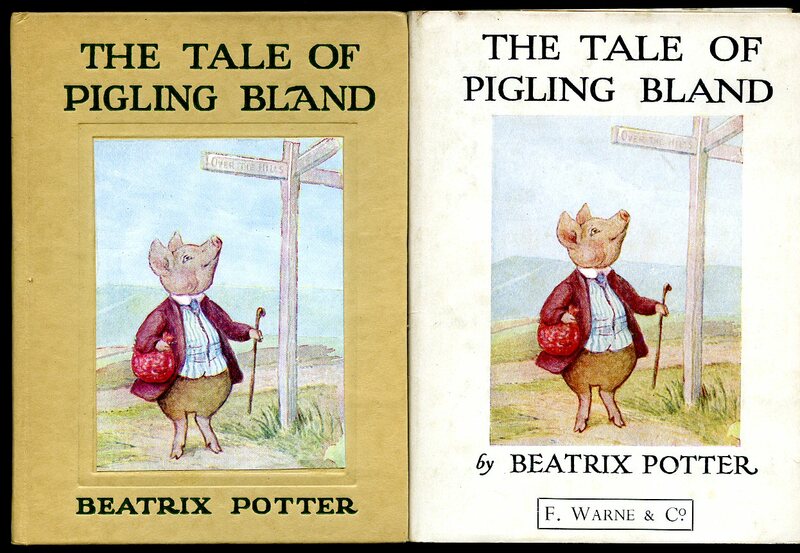 Publisher's original light brown paper covers, colour onlay to upper panel, green lettering to spine and upper panel. 5½'' x 4¼'' 85 pp. Colour illustrated end papers. Full-page colour illustrations. Four name to front end paper, contents shaken. Near Very Good condition, no dust wrapper. Member of the P.B.F.A. Published by Frederick Warne & Co., Ltd. London 1950 edition. 1950. 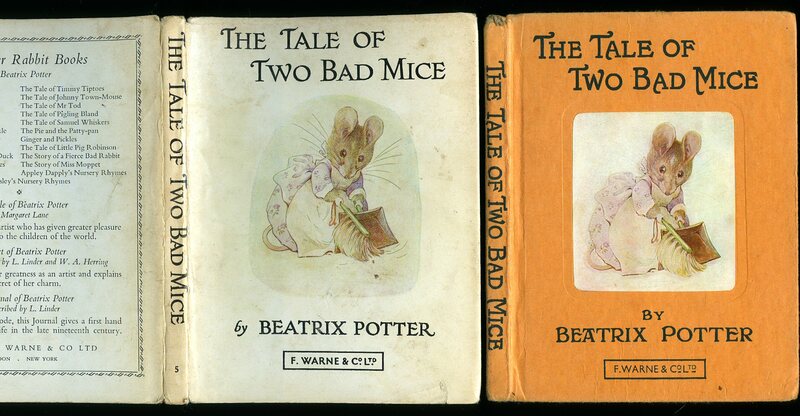 Publisher's original deep scarlet paper covers, colour onlay to upper panel, black lettering to spine and upper panel. 5½'' x 4¼'' 75 printed pages of text. Date code inside front flap of dust wrapper and last page 235.550. Colour illustrated end papers. Full-page colour illustrations. Very Good condition book in Very Good condition dust wrapper with general light soiling to white paper covers, not price clipped 3/6. Dust wrapper supplied in archival acetate film protection. Member of the P.B.F.A. Published by Frederick Warne & Co., Ltd. London 1966. 1966. 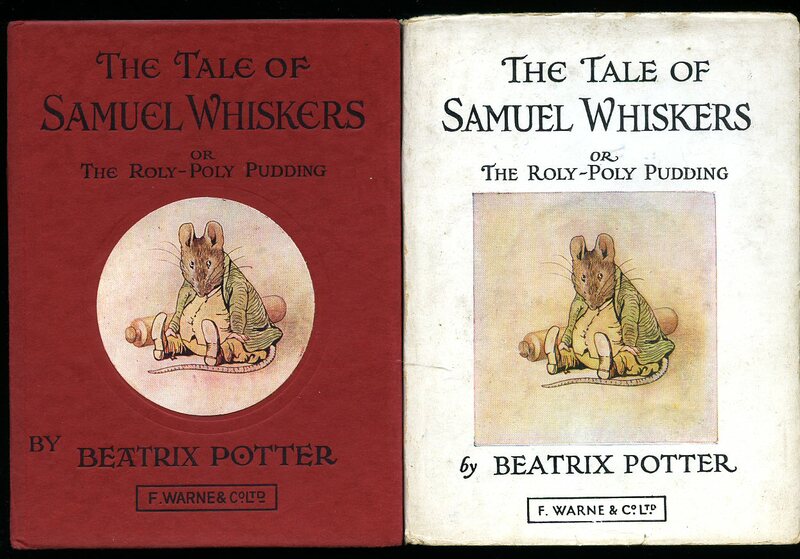 Publisher's original cream paper covers, circular colour onlay to upper panel, deep burgundy lettering to spine and upper panel. 5½'' x 4¼'' 59 pages. Date code inside 1919.466. Colour illustrated end papers. Full-page colour illustrations. Very Good condition book in Very Good condition dust wrapper with very light tanning to white paper covers, price clipped, dust wrapper without any tears or chips. Dust wrapper supplied in archival acetate film protection. Member of the P.B.F.A. 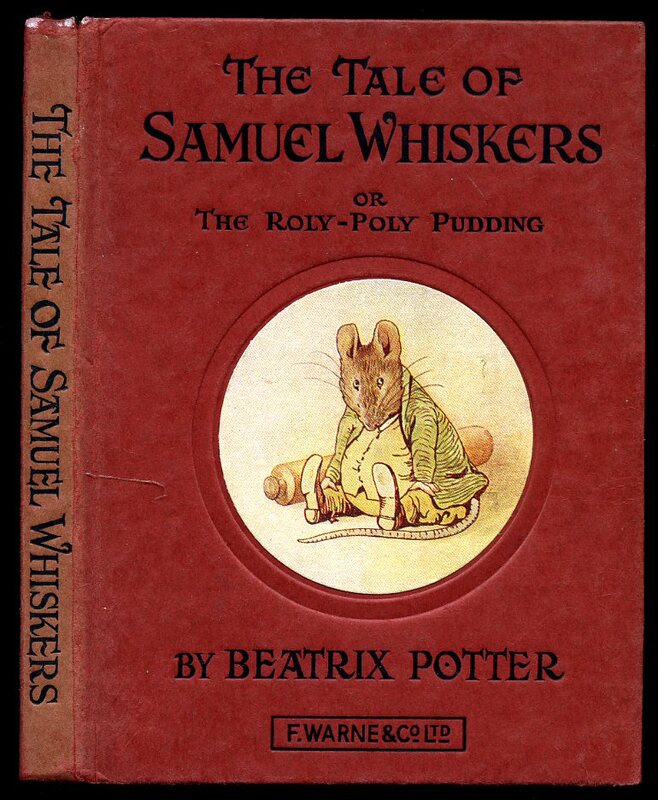 Published by Frederick Warne & Co., Ltd. London First Edition 1987. 1987. 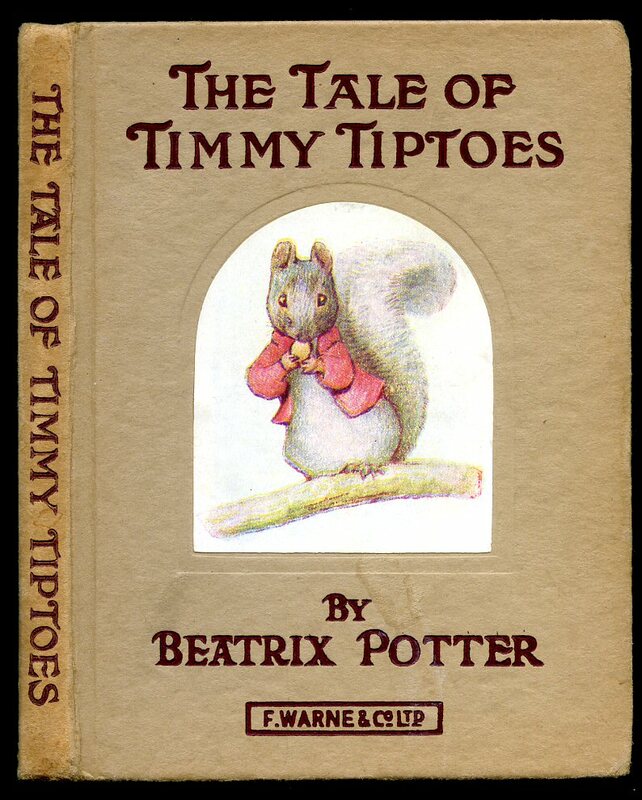 First edition hard back binding in publisher's original green cloth covers, gilt lettering to the spine, decorated end papers. Quarto 10½'' x 8¼'' 96 pages. ISBN 0723234426. Colour and monochrome illustrations throughout. Fine condition book in Fine condition dust wrapper, not price clipped, as new. Dust wrapper supplied in archive acetate film protection, this is not adhered to the book or to the dust wrapper and can easily be removed should you so wish. Member of the P.B.F.A. 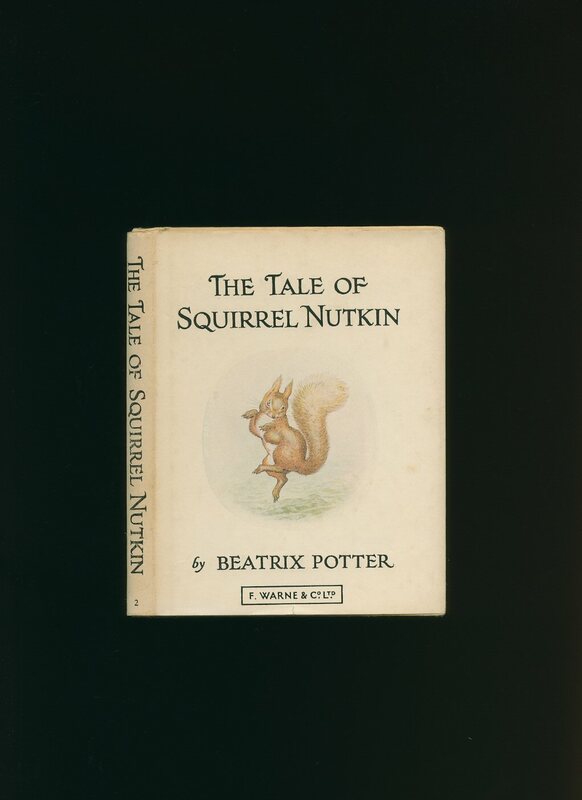 Published by Frederick Warne & Co. Ltd., London circa 1920. 1920. 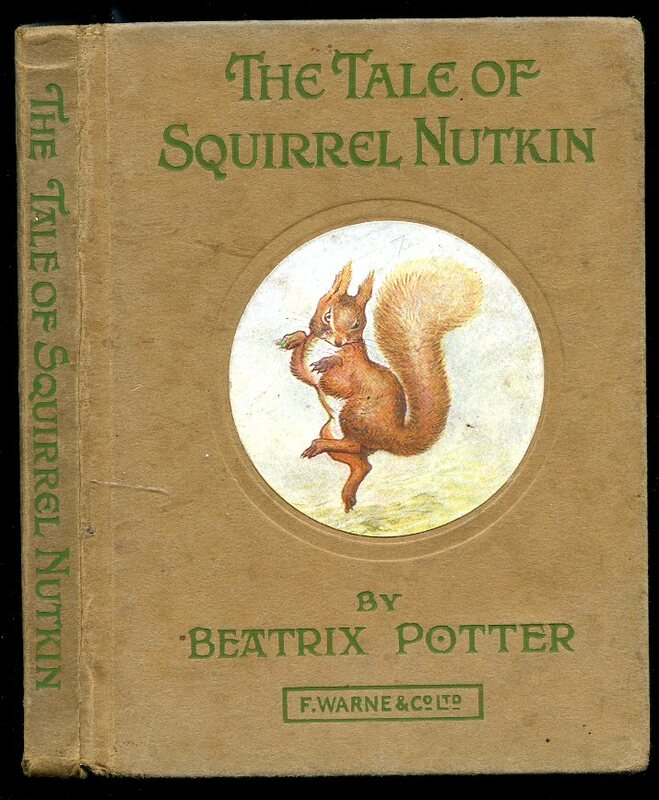 Early edition hard back binding in publisher's original buff paper covered boards, green title, author lettering and large colour onlay to the upper panel, colour illustrated end papers. 8vo. 7'' x 5½''. Printed by Edmund Evans, Rose Place, Globe Road, London. 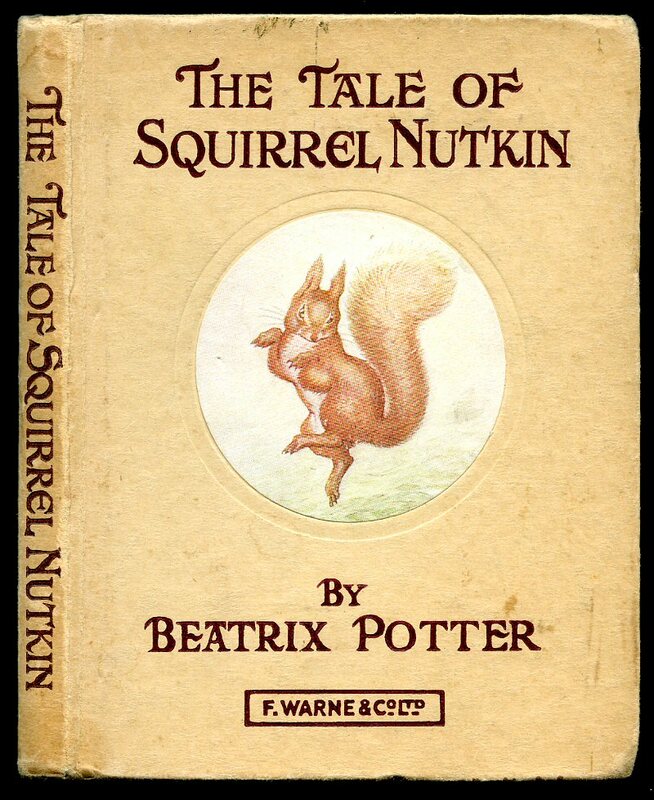 Copyright page states 1909, no date to the title page. Contains 51 numbered printed pages of text with the last leaf of text not numbered. 10 full-page single-sided colour illustrations including the frontispiece, and 20 monochrome illustrations throughout. 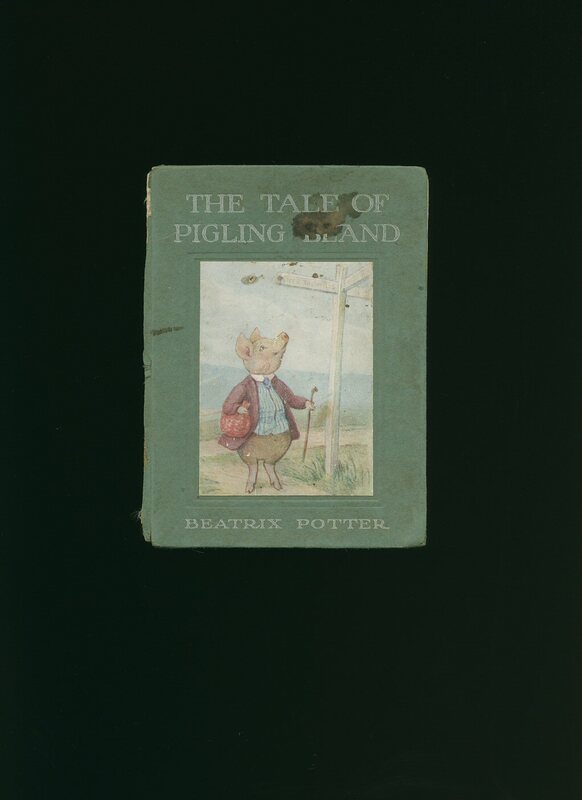 The second of Beatrix Potter's large format children's books. Repaired by our book binder with a new buff paper spine to match the existing buff paper covers, three small ink stamps to the front free end paper, small smudge marks to the title page and pages 19 and 29, light colour pencil scribble to the reverse of the second colour plate, one red pencil line to the top of page 30. Binding firm and tight having been re-sewn when the new paper spine was applied leaving the book in a Very Good sound and stable condition. We currently hold in stock over 40 other titles by this author. Member of the P.B.F.A. Published by Mills and Boon Ltd., London 1979. 1979. 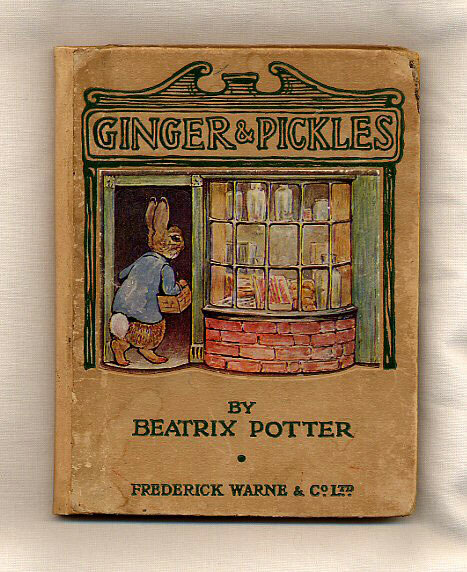 Hard back binding in publisher's original colour illustrated glazed boards. Quarto 10'' x 8''. 315 printed pages of text. ISBN 0263061027. Colour and monochrome illustrations throughout. Age foxing to the page edges, name to the front end paper. Very Good condition book, in Very Good condition dust wrapper with 70 mm closed tear to the lower fore edge, not price clipped. Member of the P.B.F.A. Published by Frederick Warne & Co., Ltd. London 1964. London 1964. Hard back cream paper covered boards with oblong with arch top pictorial onlay to front panel, bright maroon lettering, colour illustrated end papers. 4.25" x 5.6". Small tear mark to the rear end paper, clean and bright, no dust wrapper. Member of the P.B.F.A. Published by Frederick Warne & Co., Ltd. London 1963. London 1963. Hard back cream paper covered boards with circular pictorial onlay to front panel, dark maroon lettering, colour illustrated end papers. 4.25" x 5.6". Small piece tear mark to the front end paper, no dust wrapper. Member of the P.B.F.A. Published by Frederick Warne & Co., Ltd. London 1965. London 1965. 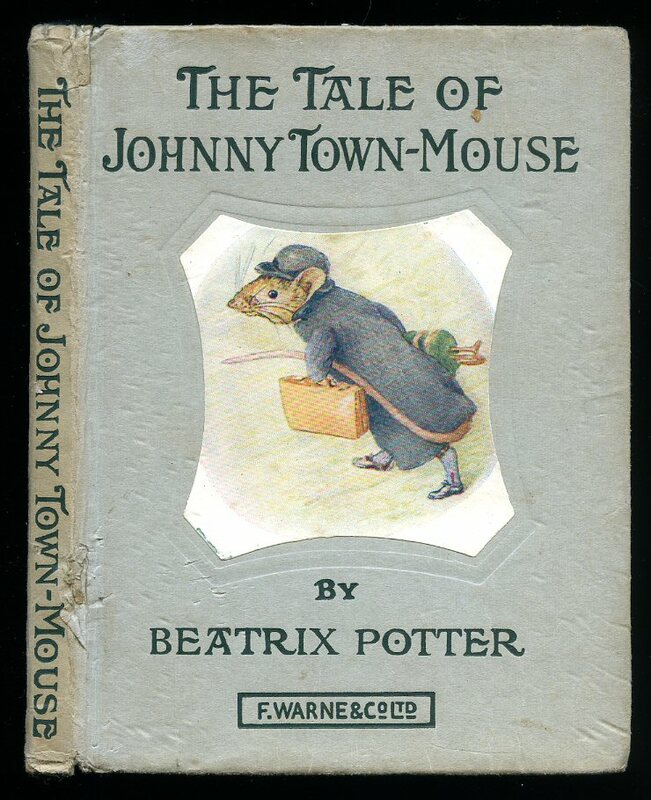 Hard back carrot coloured paper covered boards with square pictorial onlay to front panel, very dark green almost black lettering, colour illustrated end papers. 4.25" x 5.6". Contents shaken, message inside the front free end paper. Good condition book, in near Very Good condition price clipped dust wrapper with short closed tears to the edges of the spine tips and corners. Dust wrapper supplied in archive acetate film protection. Member of the P.B.F.A. Hard back cream paper covered boards with oblong pictorial onlay to front panel, dark green lettering, colour illustrated end papers. 4.25" x 5.6". Very Good condition book, in near Very Good condition dust wrapper with 20 mm piece of paper missing to the head of the spine, light rubbing to the corners, small smudge mark to the front cover, not price clipped. Dust wrapper supplied in archive acetate film protection. Member of the P.B.F.A.